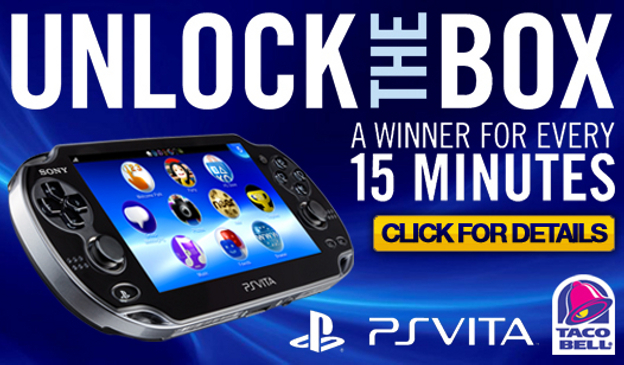 Is Taco Bell Trolling Its Vita Winners? Mountain Dew did it with the Xbox 360, now Taco Bell is bolstering its sales with the PlayStation Vita. Those who purchase a Big Box Meal, filled with a trio of artery-encrusting “Mexican delicacies” and accompanied by a medium soda with which to cleanse one’s tortured palate, also receive a code for entry into the Taco Bell “Unlock The Box” contest. This code, when entered either by mobile device or through the contest’s website, provides one with an opportunity to win a PlayStation Vita. The result is immediate and, usually, disappointing. You are not a winner. Apparently, though, even when you win you sometimes lose. Stories have come out, recently, from people who received a “Congratulations” announcement upon entering their code, asserting that they had won one of the coveted handhelds. They allege, however, that attempts to follow up were met with the assertion by Taco Bell that their codes were not, in fact, winning entries, alongside accusations that they were trying to scam the system. Questions about these events posted on the Taco Bell Facebook page have been deleted, e-mails from spurned customers unanswered. It’s worth noting that Taco Bell is not handling this contest alone. They’ve partnered with Ventura Associates, a marketing company, to promote and manage the contest. It’s not entirely clear which company is responsible for verifying the winning codes, but it appears that there is a breakdown in communication somewhere along the line. That, or this is an incredibly persistent, vocal and organized attempt to scam the contest.